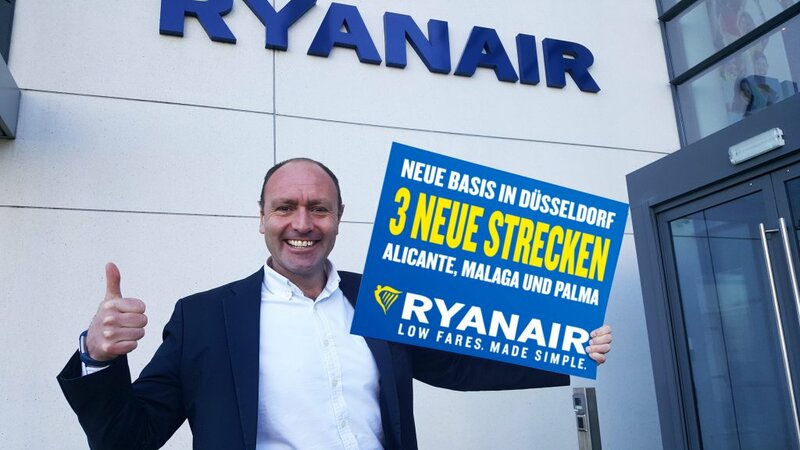 Ryanair announced that it will open a new base at Düsseldorf Airport from June, its 11th base in Germany and 86th in Europe, with 1 based aircraft, as it launched 2 new summer routes to Alicante and Malaga. These new Ryanair routes are in addition to the daily service to Palma de Mallorca which was announced earlier this year and the 12 routes operated on behalf of Laudamotion, all of which are on sale on Ryanair.com. These new routes offer will offer German customers even more routes and flights to Spanish sunshine destinations and are on sale today from €19.99 on the Ryanair.com website. Ryanair will launch its Dusseldorf winter 2018 schedule in the coming weeks. “Ryanair is pleased to announce a new base at Düsseldorf Airport, our 11th German base, and launch two new routes to Alicante and Malaga for summer 2018. These new routes are in addition to our recently announced service to Palma de Mallorca and all three will operate daily from 1st June.